Here is a listing, in more or less chronological order, of the telescopes I’ve built or owned since I started in this hobby in the early ’70’s. 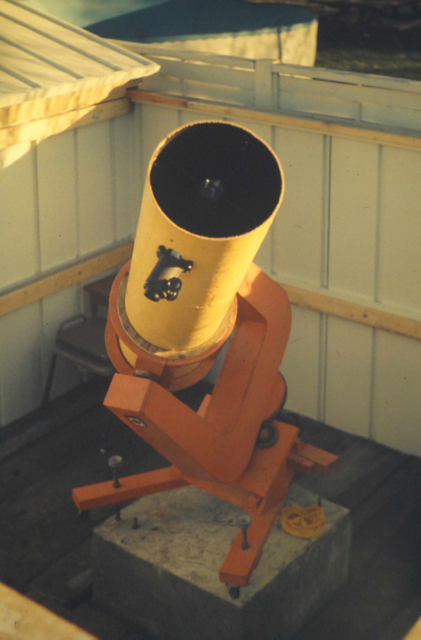 The 9TE-5 60mm f/12 Tasco refractor was my first telescope. I received it as a Christmas gift from my parents in 1973 when I had just turned 14. Although it had a very poor mount and eyepieces I really learned a lot using this telescope during the year that followed. The picture above is from the instruction sheet that came with it (and which, to my surprise, I still have!). 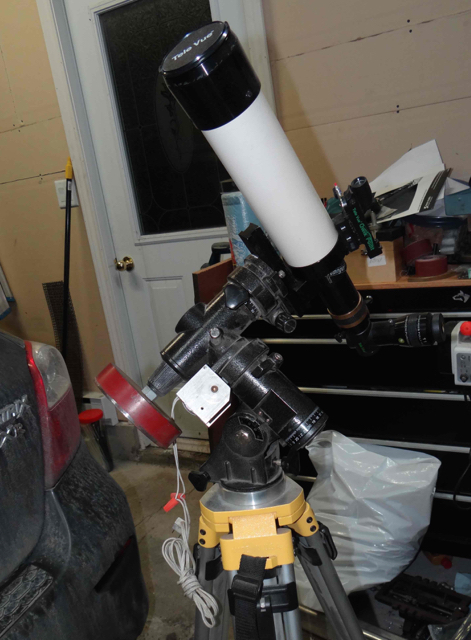 After using this telescope for a few months I joined the local astronomy club: the Ottawa Center of the Royal Astronomical Society of Canada (RASC). With the US space program in full action astronomy was very popular. 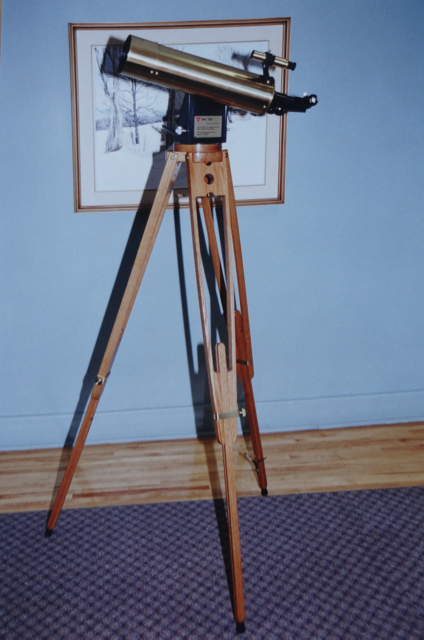 I eventually got rid of the poor tripod and mounting but still have the Optical Tube Assembly (OTA) and eyepieces. I recently joined the 60mm Yahoo telescope group and plan on re-mounting the OTA on a simple but very robust mounting and use some better 1.25″ eyepieces to see what I can observe with this modest instrument when it is properly mounted. 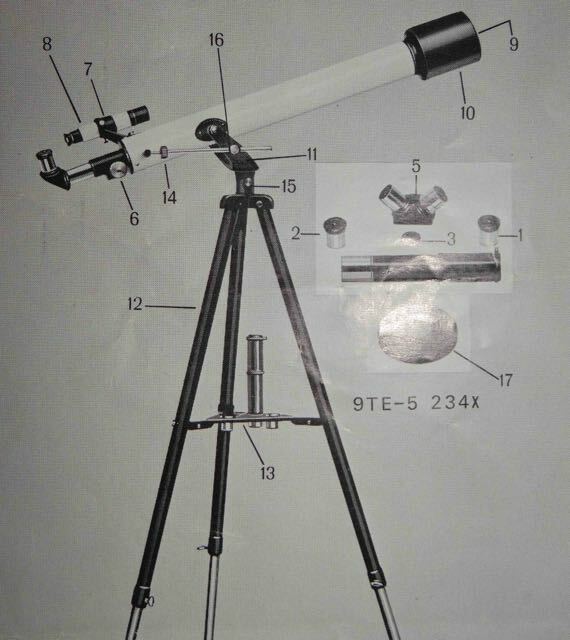 I acquired and sold one or two 6 inch f/8 newtonian telescopes over a period of about 2 years in the mid-70’s. This was one of them but quite frankly I don’t remember much about it. I think I purchased it from another amateur but it was not very satisfactory, if I remember well. I built this telescope when I was about 16 years old. Although I had ground and polished a 4 and a 6 inch mirror before, this was for me a major undertaking at the time. But I was helped by one of my mirror making mentors: Mr. Sylvio Bourgault who worked as an optical technician at the National Research Council of Canada. 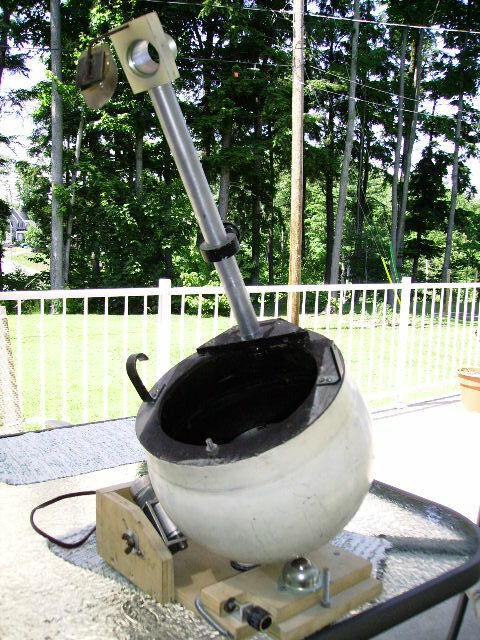 The telescope used a 12 inch diameter steel polar disc welded to a 1.5 inch diameter shaft. The back (south) end of the shaft was attached to a pillow block bearing I had found at a scrap yard in Ottawa (Cohen). The polar disc itself rode on two ball bearings attached to the wooden frame. The mount was equatorial but did not have a motor drive. I still vividly remember going with my father to a machine shop to have the disc and shaft turned and welded. That is where I discovered the metal lathe and decided that one day I would have one. The fork was made from plywood and masonite. Countersunk wooden screws were used everywhere to hold the wooden fork together. I did not have an electric screw driver so all of those screws (there must have been almost one hundred) were hand screwed with a manual screwdriver. I still remember the soar hand muscles and the blisters! The tube cradle was arranged so the tube could easily rotate around it’s optical axis. A wooden ring prevented the tube from dropping under gravity in the cradle. 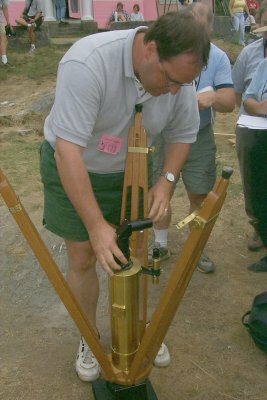 The 10 inch was presented at the 1976 Stellafane competition and was awarded the first prize for juniors. It was my first Stellafane win and I was quite proud. 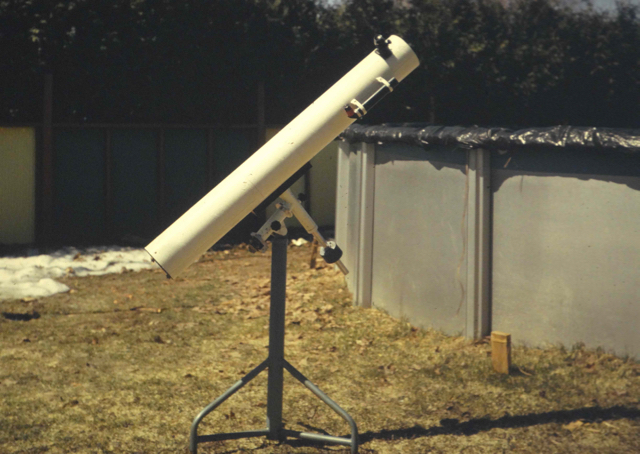 The following year, with my father’s help, I built a Roll Off Roof (ROR) observatory for the 10 inch scope out of a metal garden shed. The 10 inch was eventually decommissionned. I still have the main mirror but everything else was disposed of due to a lack of space and other projects. I hope to remount that mirror someday but I don’t know in what form yet. 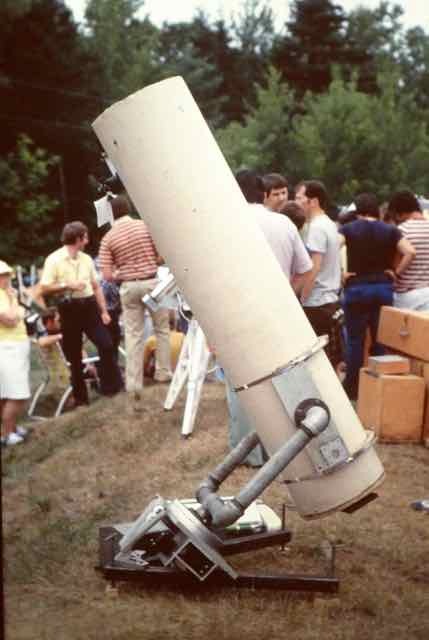 I finished this telescope in 1978. It was mounted on a 2″ pipe fork mount which itself was mounted on a driven equatorial mounting which includes two 8″ diameter Kaydon helicopter rotor bearings. The drive consisted of a double bicycle chain and sprockets driving a large (12 inch) 1.5 inch thick, laminated masonite disc on a slip clutch, driven by a synchronous motor. I stole the idea for this drive from the 30 inch telescope at Stony Ridge Observatory in California which, in it’s early years, was driven this way. The 12.5″ was extremely stable. It was awarded the first prize for Newtonian telescopes at the 1978 Stellafane telescope competition in Vermont. It has since been decommissioned because of its heavy weight and difficulty of setting up. I still have all the parts (except the fork) and I am planing to rebuild it into an f/3 or f/3.5 astrograph, replacing the chain drive with a 9″ Byers worm wheel as the main drive. 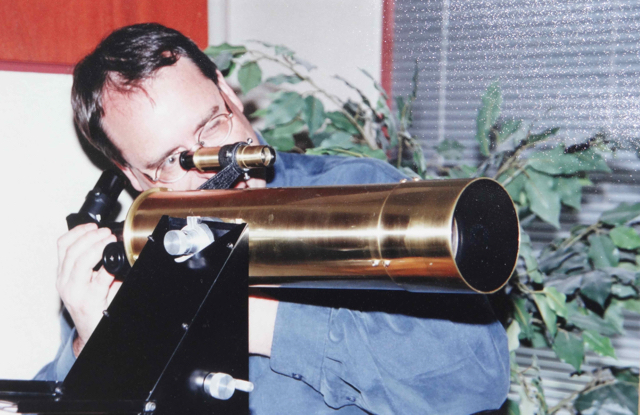 This 8 inch f/5 Fork Mounted Equatorial Newtonian Telescope was built in the early ’80’s so that I would have a relatively compact telescope I could bring with me while I was undertaking my Engineering studies at Sherbrooke University. The picture here shows it when it was presented at Stellafane in 19??. Like most of my previous telescopes it is fork mounted. A thick plywood base holds a 1.5 inch diameter brass bushing which is press fitted in the center of the wooden disc. A short shaft, attached to a welded steel fork base fits into this bushing but is not attached. It’s basically a friction disc mount. When the instrument is disassembled, the tube is removed from the fork and the fork is lifted out of the bushing. The RA drive was an interesting project: A 12 inch long square brass rod was drilled in the center and threaded (1/2 inch NF tread) all the way. The square rod was then cut longitudinally, revealing a threaded sector. This sector was then bent and sobered to an 1/8 inch thick brass by 1 inch wide flat plate which itself was rolled round on a form roller. The whole think wraps around the wooden fork base (in a turned recess) and a synchronous motor, on the end of which there is a spring loaded treaded rod, engages with the curved threaded sector. There is lots of slop and play and periodic error but it works quite well for visual observations. Although I built this telescope to be more portable, it is much too heavy for its size (probably weighs close to 60 pounds). I still have it but rarely use it. Since it is gathering dust I’ve decided to convert it to a much more portable, driven ball scope. I will recover the primary and diagonal (both in need of re-aluminizing). The picture above shows my 6 inch tracking ball scope: the very first ball scope to ever use drive rollers to track stars. I invented this dual axis tracking platform for ball scopes in the mid-’90’s. Even though it was a world first, it did not receive any recognition when it was presented at Stellafane in 1995. However, the instrument did catch the attention of the editors of Sky and Telescope magazine who asked me to write a short piece on it. It was featured in the January 1996 issue of Sky and Telescope in an article entitled “The ten top telescope ideas of the year”. The rest, as they say, is history… You can read more about this invention and this telescope here. 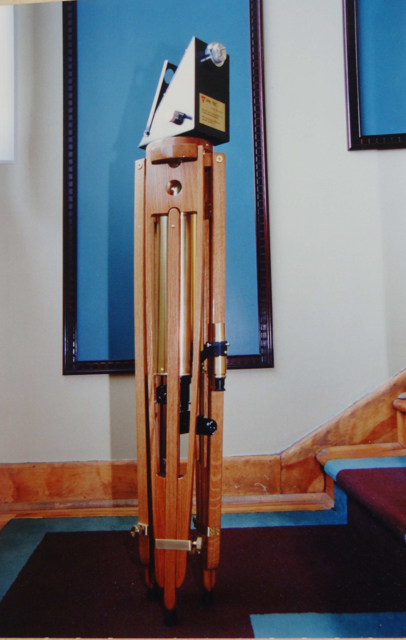 In 2001 I collaborated with a colleague at work to build this beautiful and unique brass telescope which was given as a retirement gift to a person we appreciated working with. 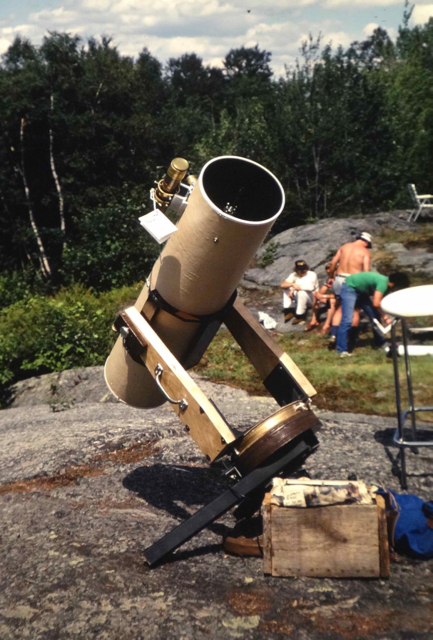 The beautiful oak tripod was built by my colleague, Mr. Serge Morency and I designed and built the alt-az telescope mounting and Optical Tube Assembly. I work for an ammunition manufacturing company. The person we gave this too was a former military officer and I decided to design the instrument around the brass cartridge cases we make. The main tube is a 105mm artillery brass cartridge case. The dew shield is part of a 105mm saluting blank case (these are much shorter) and the finder scope is made using a 20mm brass cartridge case. The OTA separates from the mounting through a knurled knob. Inside the mounting are two worm gears that are controlled from the two aluminium knobs that stick out on each side of the mounting block attached to the tripod. You can see one of those sets of knobs in the following picture. These knobs control slow motion in altitude and azimuth. This project was a lot of work, a lot more than I had initially anticipated. But the result was fantastic. Our customer was very surprised and pleasantly impressed. One of the telescopes I use the most is this 70mm TeleVue Ranger refractor. I got it through a very good deal and find it very practical for a quick view in the evening when I don’t want to get a bigger telescope out. At the moment it is mounted on a GEM I picked up for $30 at the Stellafane Swap Table. I machined a motor bracket for the worm wheel but i rarely use it. The whole thing is mounted on an aluminium Surveyor tripod for a very robust, but heavy, setup. The crown jewel of my telescope collection is my 20 inch f/3.9 Ball mounted tracking Newtonian Telescope. The instrument took over 20 years to make and it is one of the largest ball scopes in the world. 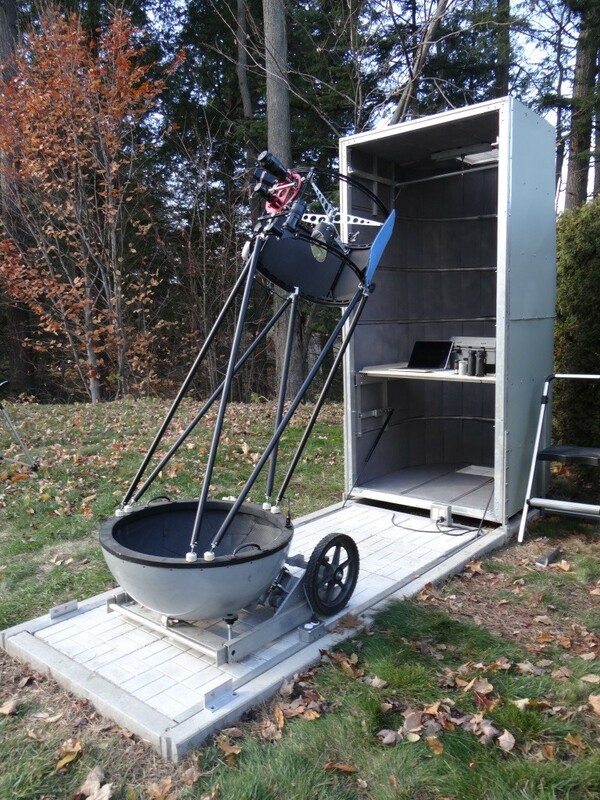 It was awarded the first prize for Mechanical Design and the second prize for Craftsmanship at the 2013 Stellafane Telescope making competition in Vermont. You can read a more detailed description of its design and construction here. The telescope is stored in a unique and specially made shelter whose design and construction is described here.